This short and colourful little picture book is a retelling of a story written, by Jallal al-din Rumi, the Turkish founder of the Whirling Dervishes. 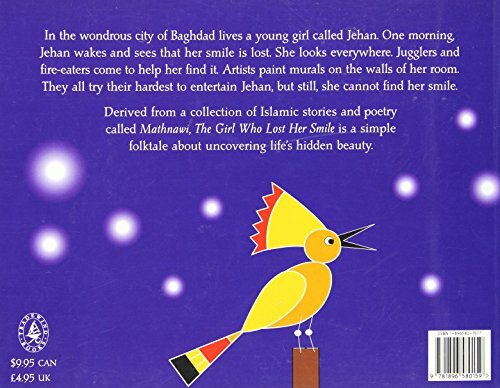 Jehan is a young girl who lives in Baghdad, and is the owner of a smile that illuminates the sun and the night sky. One morning, she wakes up to discover that her smile has vanished. As the world falls into darkness and mourning, various artists and entertainers arrive from around the world to try to restore Jehan's smile, but all of them fail until a young man carrying only 'a simple sandalwood scraper' effects an illuminating revelation. The pictures that accompany the concise text are as bright and simple as the story, almost caricatural in their depiction of the visitors and their art-forms. Readers will find interesting parallels here with the Persephone myth and other examples of Paradise lost and regained. Teachers interested in promoting philosophical discussion will find this short but elliptical and evocative tale a useful stimulus for children of all ages.